As the USA Sevens team made their victorious run to the Cup Final of the Vegas Sevens tournament last weekend, there was one question constantly being asked – why aren’t they wearing their usual Adidas kits? Indeed, it was certainly a puzzler – Adidas and USA Rugby revealed brand new jerseys for the Sevens just a few months ago, and they’ve been wearing them at the HSBC Sevens Series events… so why would they walk out for their home tournament wearing unfamiliar and unbranded gear? Firstly, some facts. USA Rugby signed a deal with Adidas less than a year ago, and claimed that the German giant would be providing them with ‘high performance’ gear for all of their teams. Secondly, the USA clearly needed new jerseys for the Vegas 7s as they were swapping their usual Emirates Airlines sponsor for DHL for the tournament. But the star-spangled unbranded kit they wore was produced for USA Rugby by UK manufacturer Samurai Sports, who were informed enough about the situation to produce both a primary and change version of the kit, yet not enough to produce socks, as most USA players were still wearing their Adidas ones (rolled down). So what gives? Well, according to Rugby Today, the issue is to do with Adidas’ inability to supply the sevens with the aforementioned ‘high performance’ kit that fellow Core Members France and New Zealand are wearing, and so they opted to secure kit from someone who could for the weekend. What we don’t know is if this is an issue purely related to these new jerseys, or if USA Rugby feel that the gear they’re getting is of inferior quality to other teams – this would seem strange as USA, France and New Zealand are all wearing the same jersey template, and when we got hands on with the Women’s World Cup jerseys from Adidas last year, there was no difference in quality or material between USA, Adidas and Black Ferns jerseys. 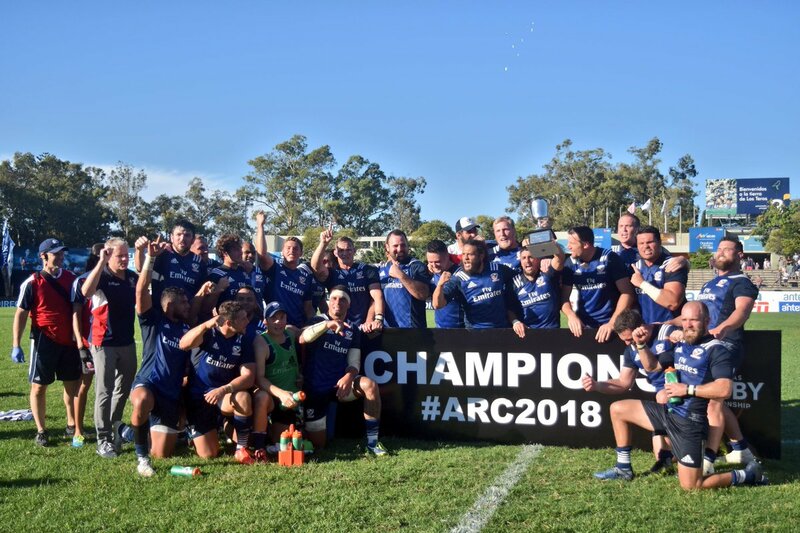 What’s more, the USA Men’s 15s defended their ARC title against Uruguay this weekend wearing the same Adidas gear that was revealed a few months ago, and the Women’s age-grade team that were also competing in Vegas this weekend were also in Adidas – so if USA Rugby is planning a break with Adidas they’re going a strange way about it. We think the truth might be found somewhere in between the lines of what’s been reported elsewhere. 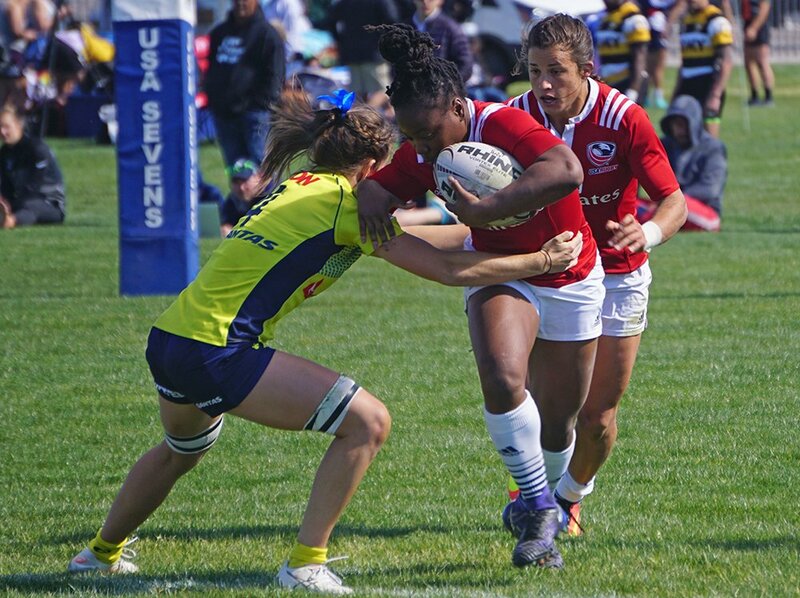 USA Rugby needed new shirts for Vegas due to the DHL sponsor change, but Adidas, being a huge sportswear brand that doesn’t really do ‘small’ was unable or unwilling to produce high-performance kit in the quantity, cost or timeframe that USA Rugby needed. So instead the Eagles were forced to turn to Samurai – a smaller and therefore probably more agile brand that could turn the kit around in a time, quantity or cost that worked for USA Rugby. All that remains to be seen is if the USA will be back in Adidas for their next event or if the unbranded weirdness continues. We’ve reached out to USA Rugby for comment on this and will update this story if and when we get a response, but in the mean time, exactly why the USA went into the most high-profile event in its rugby calendar without the three stripes on their shoulders will remain shrouded in mystery. The USA team took to the field at this weekend’s Canada Sevens wearing the same unbranded Samurai kit as they wore for the Vegas competition, but this time without the DHL main sponsor logo, and with their standard Emirates sponsor returning. This would clearly indicate that the Vegas kit change was not a one-off, and that for the time being, the USA Sevens will not be wearing Adidas gear – we’ll update this post further when we’ve received official confirmation on the situation from USA Rugby. These look good, the Adidas kit…doesn’t. Mike Friday has a link up with Samurai…. Why they don’t go with Nike is beyond me. I’ve been wanting, hoping, wishing for it for 20 some odd years. Always disappointed when they announce the latest kit “partner” and it is some company that always puts the US last in line for design and sometime performance. Money is the main reason, obviously. But Adidas do some quality rugby stuff. They outfit New Zealand, France, Munster, Harlequins, and all five of the New Zealand Super Rugby teams. I’ve worn the New Zealand and Munster jerseys, and they’re really nice. Nike have kind of gotten out of the rugby game. They ended their deals with Saracens and Brisbane Broncos, and only have Argentina, Jaguares and Toulouse as their outfitted teams. The Adidas Jerseys look like crap and can barely be distinguished from the France model. The Samurai shirts represent the US stars and stripes better, and are distinctive.